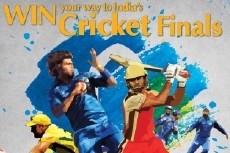 Abu Dhabi – 5 April 2015 – Finance House P.J.S.C (FH) announced that it has launched a new promotional campaign that targets cricket fans and enthusiasts who hold a strong passion for this sport. The promotion gives a chance to those who apply for a Finance House Credit Card or Executive Finance facility to win big and exciting prizes. The one-month campaign will be concluded with a raffle draw that will be held on the 17th of May, 2015, whereby 2 couples will each be awarded an all-inclusive trip comprising air flight tickets, one night hotel stay and tickets to attend the cricket final match in India. In addition, starting the 12th of April 2015, weekly raffle draws will be held that will grant 2 enrollers the chance of winning gold worth AED 1,000. Finance House offers a wide range of credit cards including Blue, Gold, Platinum and Titanium credit cards which come with a variety of favourable value added benefits, such as free-for-life, no annual fees, free supplementary cards, and highest grace period in the UAE of up to 59 days, among many other benefits. Finance House Credit Card holders also enjoy a host of unmatched discounts and deals on Value House website. In addition, Finance House offers Executive Finance, a top-of-the-line personal finance facility tailored to suit the needs of executives.